Greetings from your WoodWeek news team. Another week for our industry to bask in the glow of fine weather and good industry news. The Government’s One Billion Trees programme is realising economic, environmental and social benefits across regional New Zealand through its forestry joint venture agreements, just a year after it was launched. Te Uru Rakau reported they have signed 21 joint ventures with landowners across the country. One of the joint ventures plans to plant of 2,843 hectares of commercial forest. 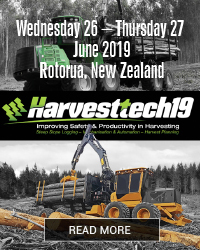 Registrations for our upcoming HarvestTECH conference in June are pouring in. All of the stands, both indoor and outdoor are sold out and we have a great lineup of speakers planned for you. Register now online or complete your paper registration and email it to us. Do it now to ensure your team doesn't miss out. Looking to markets, China had another record year of softwood log imports in 2018, when over 40 million m3 of logs landed at Chinese ports. This was the third consecutive year of year-over- year- increases, with 2018 volumes being up 37% from 2015. Although import volumes fell slightly from the 3Q/18 to the 4Q/18, the December numbers were the second highest monthly imports on record. Looking to the regions, KiwiRail plans to increase its log capacity out of Wairarapa by about a third to cater for the increased harvest and reduce the number of trucks travelling into CentrePort in Wellington. The company runs two trains on weekdays – typically 15 wagons each - and twice as many at the weekend when there are fewer commuter services. Further south, Merrill and Ring won an award for going above and beyond to harvest pines at a sensitive Marlborough site, in the Branch River pine plantation in the Upper Wairau Valley. Last week’s MobileTECH conference was a resounding success. Almost 300 technology developers and early adopters of new technology gathered from across the primary sector, including forestry and horticulture. Across the agritech sector the raft of innovations being developed and implemented are discussed. This key technology event is now well established on the calendar for the country's primary sector. It also continues to draw significant numbers from Australia and Europe. Finally, monitoring by DOC has confirmed the predicted mega mast or heavy seeding in New Zealand’s forests this autumn. Sampling results point to the biggest beech mast for more than 40 years with exceptionally heavy seed loads in South Island forests. Holy cow Batman - Look at that! One Billion Trees creating wide benefits - The Government’s One Billion Trees programme is realising economic, environmental and social benefits across regional New Zealand through its forestry joint venture agreements, just a year after it was launched, Forestry Minister Shane Jones announced late last week. A total of 21 joint ventures have been signed between Te Uru R?kau (Forestry New Zealand) – the lead agency of the Programme - and landowners across the country. “Te Uri o Hau is the second largest planting initiative for the One Billion Trees Programme to date,” Forestry Minister Shane Jones said. “This brings the total planting area across joint ventures to 13,000 hectares – over halfway to our total of 24,000 hectares. “These agreements are seeing planting and silviculture jobs created that weren’t there before, they’re offering landowners, including M?ori, the ability to diversify income and improve land productivity, and they’re creating real environmental and social benefits too. “The wider One Billion Trees goal to plant at least one billion trees by 2028 is an ambitious one, but is a commitment from the Government to drive regional revitalisation and deliver benefits to our people and our environment. It also supports Maori to realise the potential of their land,” Shane Jones said. 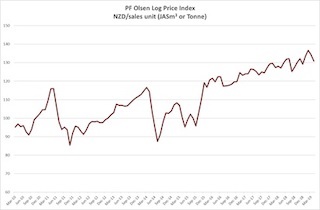 According to PF Olsen, at wharf gate (AWG) prices for logs delivered to ports around New Zealand decreased on average 7 NZD per JASm3 in April. This decrease in AWG prices is due to a combination of increased shipping costs and uncertainty in the China log market. 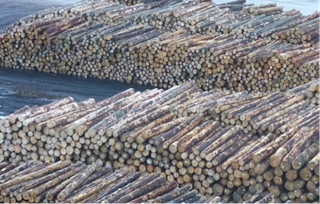 While the demand for logs is at record levels, there is an imbalance between log and domestic wholesale prices. 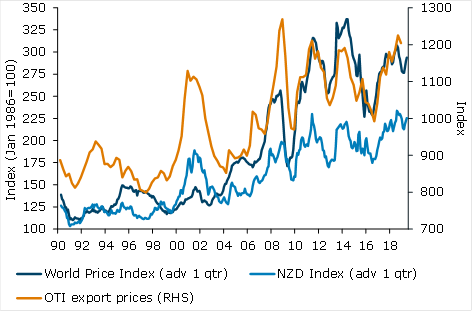 There are log vessels enroute to China from New Zealand without confirmed Letters of Credit (LCs) and Chinese log buyers are using this opportunity to try and negotiate log prices down. The company runs two trains on weekdays – typically 15 wagons each - and twice as many at the weekend when there are fewer commuter services. Alan Piper, the group’s sales and commercial general manager, says the firm has no plans for additional services. But he says the weekday trains currently have surplus capacity and just require extra wagons to increase their loads. “We are planning to add 15 wagons to one of the daily trains in May, once more wagons become available,” he told BusinessDesk. “That will increase the capacity by around 100,000 tonnes a year from the current 270,000 tonnes” and reduce truck movements over the Remutaka Range by about 6,000, he said. Log exports are booming, with many ports working to increase capacity to handle trees planted in the 1990s. Logs and timber are the country’s third- largest export and brought in $5.3 billion in the 12 months through February, 12 percent more than a year earlier. KiwiRail is also investing heavily to capture more of that harvest for its own business. It is converting about 100 container wagons annually to carry logs and is expecting to receive an additional 200 new log wagons by the end of the year. 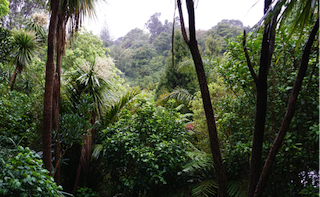 New Zealand has about 1.7 million hectares of plantation forest, according to the Ministry for Primary Industries. The southern North Island – including Taranaki but excluding Central Hawke’s Bay – accounts for about 161,400 ha of that. CentrePort handled 891,500 tonnes of logs in the six months through December, 36 percent more than a year earlier. Port Taranaki handled about 425,000 tonnes in the same period, a 24 percent increase. Napier Port handled a record 2.2 million tonnes in the 12 months through September, 35 percent more than the year before. Wairarapa and Tararua is home to almost 70,000 ha of forest. KiwiRail delivers logs from the Waingawa hub south of Masterton. It was established in 2016 by CentrePort and local foresters. A new venture active this month wants to find ways to use that facility more efficiently. Forest Enterprises Growth, New Forests and Feilding-based FOMS have formed Log Distribution to better coordinate their shipments. The trio, some of whom also have operations around Gisborne and Rangitikei, are collaborating around their common interests in Hawke’s Bay and Wairarapa. Forest Enterprises chief executive Bert Hughes says recent changes mean all three firms are using Tauranga-based TPT to manage their export marketing and scheduling of their shipments. While they are still competing for sales, their logs are going on the same ships so they can work collaboratively to gather consignments and get vessels loaded quicker. Trees the partners source or harvest in Hawke’s Bay will continue to be shipped through Napier Port. Log Distribution’s early focus will be on ways to improve coordination of harvests, trucking and use of Waingawa. “We expect to put 600,000 tonnes through Wellington” a year, he told BusinessDesk. “Once we get that right, we can grow it out from there.” Hughes is expecting a steady increase in the Wairarapa harvest during the next five years and CentrePort is expanding storage at Waingawa. Burt he said reducing ‘choke-points’ in the logistics chain will be key to making better use of the region’s rail and port infrastructure and reducing truck movements on the Remutaka Range, he says. Being “a bit more careful” about the grade of logs being cut may improve the use of space at Waingawa and increase stock turn, he said. 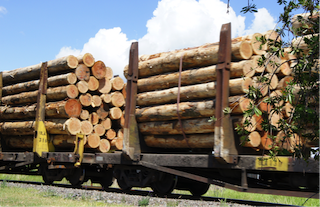 Last week, Hughes said about 8,000 tonnes of logs were being railed to CentrePort weekly – the equivalent of 40 log trucks a day. Starting overnight services would be ideal, but while the supply of locomotives, log wagons and drivers remains tight, firms have to find other ways to maximise the use of the assets available. Forest management company Merrill and Ring have been acknowledged for going above and beyond to harvest pines at a sensitive Marlborough site. 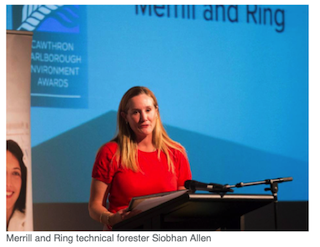 For its work around ecologically significant sites at the Branch River pine plantation in the Upper Wairau Valley, the company took out the forestry category at the 2019 Cawthron Marlborough Environment Awards last month. The biennial awards showcase businesses and community projects that protect and enhance the environment. As the property managers for the Branch River pine plantation property - on behalf of Australian landowners New Forests - Merrill and Ring's Blenheim- based team have worked to ensure pine trees are being felled and extracted more carefully and t?tara seed is being collected from the native forest remnants and grown out to seedlings. Merrill and Ring technical forester Siobhan Allen said the totara project took in an area of around 25 hectares. The company hoped to complete the project within four years but this would be dictated by how long it took for new totara seedlings to germinate. Similar projects that involved taking land out of production and putting it back into riparian areas were anticipated for the rest of the companies they manage, Allen said. Award judges were impressed by the innovative thinking to protect biodiversity and manage slash and sediment, which are industry-wide issues. "As a management company overseeing thousands of hectares of plantations in Marlborough, Merrill and Ring has potential to influence the industry," they said. "By aiming for best practice, they're showing other forest owners how to make environmental sustainability a priority, while improving health and safety on the hill." Managing director Kyle Heagney said the recognition was a good way of showing what the company did from an environmental point of view. "Often people can't see what we do because a lot of the properties we manage are a long way from public roads or out of view." Merrill and Ring manages approximately 15,000 hectares of forested land in New Zealand and selling around 250,000 tonnes of logs annually. Monitoring by the Department of Conservation has confirmed the predicted mega mast or heavy seeding in New Zealand’s forests this autumn according to a statement from Conservation Minister Eugenie Sage. “If we don’t act, we could lose populations of bird species like our tree-hole nesting k?k?riki/orange-fronted parakeet and mohua, and bats, which are so vulnerable to rat plagues. DOC’s Tiakina Nga Manu predator control programme, previously known as Battle for our Birds, uses aerially applied 1080 pesticide and large-scale trapping to protect native birds, bats, frogs, lizards and giant land snails at the most important sites across the country. This work is carefully targeted to sustain the most vulnerable populations of kiwi, k?k?, k?kako, kea, whio/blue duck, mohua/yellowhead, k?k?riki/orange-fronted parakeet, rock wren/tuke, long and short tailed bats/pekapeka, native frogs and Powelliphanta snails. The Cork-based company, whose clients include Coillte, the World Bank Group and the European Space Agency, is lining up a multimillion euro funding round over the next 12 months to fund the growth plan, which will see it entering into new markets. The move comes as the United Nations predicts that demand for forestry products will double by 2040. Founded in 2005 by Enda Keane and Garrett Mullooly, Treemetrics has developed a cloud-based forestry management platform called ForestHQ, which contains a series of tools that effectively replace traditional methods of managing forests, many of which have been in place for hundreds of years. Profitability - Treemetrics captures and analyses forestry data using satellite communications technology to enable forest owners and managers to maximise sustainable production and profitability. The software is so effective it can provide tracking details of individual forestry products “from the stump to the shop”. The Enterprise Ireland-backed company has in recent years built a successful business largely on the back of word-of-mouth recommendations. It is now looking to expand beyond its core markets in Ireland, Britain and continental Europe to take advantage of sales opportunities in newer markets such as South America and Australia. It is also looking to make its product available to a wider cohort of users beyond forestry managers. Dutch company Port-Liner is building two giant all-electric barges dubbed the ‘Tesla ships‘. The company announced that the vessels will be ready by this autumn and will be inaugurated by sailing the Wilhelmina canal in the Netherlands. Holy flying motorcycles! ... (as Robin said to Batman) – Jetpack Aviation is about to become a very different company. The startup has launched pre-orders this week for the moonshot of moonshots, the Speeder, a personal vertical take- off and landing vehicle with a svelte concept design that looks straight out of Star Wars or Halo. 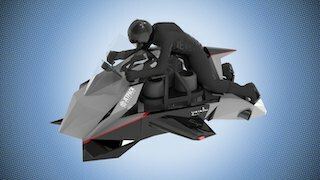 And while an eight-person startup aiming to build out a fleet of $380,000 “flying motorcycles” might seem like a tall order, Y Combinator, a top accelerator known for its occasionally bizarre bets, is gambling on the company and its jet engine- obsessed CEO in one of its latest investments. Don’t you just love Little Johnny…..
'Why do you do that, mummy?' he asked. The math teacher saw that little Johnny wasn't paying attention in class.